Chapter 13, The Market for Liberty. Many people ask, "But how in the world could a laissez-faire society deal with aggression by foreign nations, since it would have no government to protect it?" Behind this question are two unrealized assumptions: first, that government is some sort of extra-societal entity with resources of its own  resources which can only be tapped for defense by the action of government  and, second, that government does, in fact, defend its citizens. In reality, government must draw all its resources from the society over which it rules. When a governmentally controlled society takes defensive action against an aggression by a foreign power, where does it get the resources necessary to take that action? The men who fight are private individuals, usually conscripted into government service. The armaments are produced by private individuals working at their jobs. The money to pay for these armaments and the pittance doled out to the conscripts, as well as the money to pay the salaries of that small minority comprising the other members of the armed forces, is confiscated from private individuals by means of taxation. Government’s only contribution is to organize the whole effort by the use of force  the force of the draft, taxation, and other, more minor coercions, such as rationing, wage and price ceilings, travel restrictions, etc. So, to maintain that government is necessary to defend a society from foreign aggression is to maintain that it is necessary to use domestic aggression against the citizens in order to protect them from foreign aggression. In spite of the obvious immorality of forcing men to protect themselves against force, some people still maintain that a coerced defense is more efficient than a willing one and is, therefore, permissible or even necessary in an emergency situation such as war. A brief examination will show the fallacy of this variation of the moral/practical dichotomy. The success of any endeavor, including war, depends on the amount of thought and effort put into it by those involved. Under the pressure of force, a man may be induced to put forth a great deal of effort and even a little thought, but his reluctant, fear-driven exertions can’t compare in efficiency and productivity with the ambitious and tireless efforts of a free man striving to accomplish something he really wants to get done. The man who works enthusiastically not only works more efficiently, he also uses his mind to discover new and better ways of reaching the goal, and such innovation is the key to success. Furthermore, a system of force is always wasteful of resources, because the more unwilling is the victim of the force, the more energy must be diverted to keeping him in line and the less is left to accomplish the task. Men who are forced to do what they don’t want to (or not to do what they do want to) are amazingly good at devising devious and complicated ways to cheat on the system which enslaves them. This is why even the most totalitarian of governments find that they cannot wage war without huge propaganda efforts aimed at convincing their own people of the justice and necessity of the war. Freedom is not only as moral as governmental slavery is immoral, it is as practical as government is impractical. It is foolish to suppose that men would not organize to defend themselves, and do so very effectively, if they were not forced to. Men are not so blind that they can’t grasp the value of freedom, nor so indifferent to life that they will not defend their values. Nor are they so stupid that they need politicians, bureaucrats, and Pentagon generals to tell them how to organize and what to do. The freer people are, the more efficiently they will perform. This being true, a free-market system of defense against foreign aggression can be expected to be very effective, in contrast to a governmental system of comparable size, resources, and maturity. The belief that society couldn’t be defended without a government also assumes that government does, indeed, protect the society over which it rules. But when it is realized that government really has nothing except what it takes by force from its citizens, it becomes obvious that the government can’t possibly protect the people, because it doesn’t have the resources to do so. In fact, government, without the citizens on whom it parasitizes, couldn’t even protect itself! Throughout history, people have been talked into submitting to the tyrannies of their governments because, they were told, their government was vitally necessary to protect them from the even more terrible depredations of other governments. The governments, having put over this bit of propaganda, then proceeded to cajole and coerce their citizens into protecting them! Governments never defend their citizens; they can’t. What they do is make the citizens defend them, usually after their stupid and imperialistic policies have aggravated or threatened another government to the point of armed conflict. Governmental protection against foreign aggression is a myth (but a myth which, sad to say, most people actually believe in). Government can’t defend its citizens, and it is foolish and sacrificial for the citizens to defend a coercive monopoly which not only enslaves them but makes a practice of provoking conflicts with other coercive monopolies  i.e., with other governments. In the matter of foreign aggression, government is far more of a liability than an asset, and people would be much better off with a free-market system of defense. The free-market means of defense against foreign aggression would differ in scope and intensity, but not in principle from the free-market means of defense against domestic aggression (such as a gang of local hoodlums). In either case, the principle involved is that each man has both the liberty and the responsibility to defend his own values to the extent he considers it to be in his own self-interest. Morally, no man may be prevented from defending himself and his values, nor may he be forced to defend them if he doesn’t want to do so. even if they are clearly in the majority. Nor would it be practical for them to do so. A man who is coerced into defending his neighbors against a foreign aggressor may decide to spend part of his efforts on defending himself against his coercive neighbors instead. Critics have questioned whether insurance companies could afford to pay off all the claims caused by the widespread destruction of a modern war, should their defenses be overpowered. If the war were lost, of course, neither the insurance company personnel, nor their insureds, nor anyone else would be in a position to carry on normal financial dealings. If it were won, the insurance companies would have to either pay off or go out of business. In determining whether an insurance company would be financially able to pay, there are two important considerations  the extent and intensity of the damage, and the extent of the insurance company’s assets. The amount of damage is impossible to predict in advance of the actual situation, but there is no reason to assume that it would necessarily be so severe as to include the total destruction of all major cities. Governments usually launch wars of destruction only against areas which, because of the actions of their own governments, pose a threat to the attacker. A laissez-faire society, having no government to make imperialistic threats, would be unlikely to become the object of a war of destruction. A foreign government might decide to enrich itself by annexing the free territory, but it would attempt to do so by a war of conquest rather than by a war of destruction. Wars of conquest are much less devastating and call for the restrained use of conventional weapons rather than the use of nuclear weapons. The simple reason for this is that the conqueror stands to reap a great deal less profit from rubble and corpses than he does from factories and slaves. Another reason to assume that a war against a laissez-faire society would not be totally destructive of that society is that effective defenses against modern warfare undoubtedly can be devised. The fact that governments have not yet devised such defenses only proves that governments are both profoundly inefficient and more interested in imperialistic power grabs than in defending their citizens. Given the efficiency of the free market and the incentive of the profit motive (because people would be willing to pay for effective defense "hardware" if they were allowed to buy it), innovators would doubtless come up with many defensive devices far superior to the military war machine now imposed upon us. The second consideration in determining insurance companies’ ability to pay claims arising from foreign aggression is the extent of their assets. Even in our society, where they are hamstrung by governmental regulations, insurance companies manage to hold vast and varied assets, spread over wide financial and geographic areas. They also make a practice of dividing large risks among various companies so that a sudden, extensive amount of destruction can be paid for without bankrupting any of them. This is the reason that insurance companies can pay out the millions of dollars in claims which arise from major hurricanes, tornadoes, earthquakes, etc., and can do so again and again without being driven out of business. In a laissez-faire society, insurance companies should be even better based financially than they are in our governmentally crippled economy. This means that an attacker would have to succeed in wiping out a large portion of the assets of the whole society in order to put the insurance companies out of business. But there is no reason to assume that a foreign government would attack the whole free area at once (since, without a government, it wouldn’t be a single political entity) or that it would succeed in destroying most of it if it did. Although there is no absolute guarantee that insurance companies would be financially able to pay off the claims arising from an attack by a foreign power, the chances that they would are very good. The actual defense of a laissez-faire society would be furnished by defense companies (both independent ones and those which were subsidiaries of insurance companies). These defenses would consist of whatever military personnel and matriel were necessary to defeat the forces of any nation threatening (or potentially threatening) the insureds. Such defenses would vary in size and type according to the threat posed, and they could include anything from spies and foot soldiers to radar networks and defensive missiles. Since the development and maintenance of modern weaponry is quite expensive, all but the largest insurance companies would probably pool their efforts and resources under competitive pressure to provide the best possible protection at the lowest cost. For the same reasons of efficiency, they would tend to purchase all their foreign aggression defense needs from a few outstanding companies which could cooperate closely with each other. Competition between the defense companies to get such profitable business would foster the development of the most powerful and efficient defense system rationally warranted. Technological innovations which are at present unforeseeable would constantly upgrade its safety and effectiveness. No governmental system, with its miles of red tape and built-in politicking, pork barreling, wire pulling, and power grabbing could even remotely approximate the potency and efficiency naturally generated by the free-market forces (which are always moving to meet demand). Those who doubt that "the private sector" of the economy could sustain the expense of a free enterprise defense system would do well to consider two facts. First, "the public sector" gets its money from the same source as does "the private sector"  the wealth produced by individuals. The difference is that "the public sector" takes this wealth by force (which is legal robbery)  but it does not thereby have access to a larger pool of resources. On the contrary, by draining the economy by taxation and hobbling it with restrictions, the government actually diminishes the total supply of available resources. A major portion of the cost of defense against foreign aggression in a laissez-faire society would be borne originally by business and industry, as owners of industrial plants obviously have a much greater investment to defend than do owners of little houses in suburbia. If there were any real threat of aggression by a foreign power, businessmen would all be strongly motivated to buy insurance against that aggression, for the same reason that they buy fire insurance, even though they could save money in the short run by not doing so. An interesting result of this fact is that the cost of defense would ultimately tend to be spread among the whole population, since defense costs, along with overhead and other such costs, would have to be included in the prices paid for goods by consumers. So, the concern that "free riders" might get along without paying for their own defense by parasitically depending on the defenses paid for by their neighbors is groundless. It is based on a misconception of how the free-market system would operate. The role of business and industry as major consumers of foreign-aggression insurance would operate to unify the free area in the face of any aggression. An auto plant in Michigan, for example, might well have a vital source of raw materials in Montana, a parts plant in Ontario, a branch plant in California, warehouses in Texas, and outlets all over North America. Every one of these facilities is important to some degree to the management of that Michigan factory, so it will want to have them defended, each to the extent of its importance. Add to this the concern of the owners and managers of these facilities for their own businesses and for all the other businesses on which they, in turn, depend, and a vast, multiple network of interlocking defense systems emerges. The involvement of the insurance companies, with their diversified financial holdings and their far-flung markets would immeasurably strengthen this defensive network. Such a multiple network of interlocking defense systems is a far cry from the common but erroneous picture of small cities, businesses, and individuals, unprotected by a government, falling one by one before an advancing enemy horde. Note, however, that such a defense network would not obligate any individual to contribute money or effort to any defensive action in which his values were not threatened. Under the present governmental system of collectivistic defense within arbitrary boundaries, a Californian would be forced to sacrifice his values and possibly his life in order to defend the State of Maine, even though he had no interest at all in the matter. At the same time, a man a few miles away in Quebec, because he was on the other side of a particular river, would have to sit idly by unless his own government decided to take some action. This is because governmental defense, like any other governmental action, is and must be collectivistic in nature. With a free-market defense system, each man acts to defend his own values to the extent he wishes to have them defended, regardless of what piece of real estate he happens to be occupying. No man is forced to sacrifice for the defense of the collective system of a coercive gang called government. A free-market defense system would also make it very difficult for an attacker to obtain a surrender. Just as a laissez-faire society would have no government to start a war, it would have no government to capitulate. The defenders would fight as long, and only as long, as they believed was in their self-interest. Even the insurance companies and defense agencies couldn’t negotiate a surrender, because their agreements could bind no one but the persons who actually signed them. It is interesting to speculate on what an aggressive foreign nation would do if confronted with such a situation. In a free-market defense system, the size of the armies and the expenditures for armaments would be automatically regulated according to the need for them. Consumers, kept informed of the world situation by the news media and by insurance advertising, would buy more insurance when aggression threatened, and less when the tensions eased. This would be particularly true of the big businesses and industries constituting the largest single insurance customers. They would be very foresighted in their purchase of foreign aggression insurance, just as they must be foresighted in all their other dealings. Furthermore, competition would force defense costs to be held down, so that all armaments would have to be either engaged in necessary defensive uses or disposed of, as idle armaments would not be worth their keep. No army could grow beyond what the market would support, and the market would never support an army larger than was actually necessary for defense, because force is a nonproductive expenditure of energy. This automatic responsiveness of arms to world situation, with a built-in arms limitation, would offer several important advantages. First, it would avoid the economic drain of maintaining standing armies larger than necessary, yet still allow for quick increase in arms when needed. Second, it would put an end to the dangerous irritations and provocations to foreign nations which are always incident to maintaining large, imperialistic armies around the world and, thus, would remove a major source of hostility and tension. Third, it would prevent all the various meddlings, aggressions, and "brushfire wars" which result from trying to play "world policeman" and regulate the affairs of everyone on the globe. And fourth, it would guarantee that an overgrown military machine could never be seized by a would-be dictator and used against the people of the laissez-faire society themselves (a guarantee which no constitution can possibly make). A free-market defense system would also permanently end the danger that some careless or power mad politician might "push the button" and bring down on the hapless citizens all the retaliatory violence of "the other side." A free-market business wouldn’t gain power by "pushing the button"; it would lose a tremendous amount of assets. Consequently, any military action by the free-market protection agencies would be strictly defensive, and undertaken only when all other means of meeting the threat had failed. And, along with all its other advantages, a free-market defense system would put a permanent end to the blood-spattered immorality of the draft. The professional, voluntary defense forces of the market would be far superior to governmental conscript forces. Conscript armies are terribly expensive to maintain because of the constant need for training new conscripts to fill the places of that great and sensible majority who leave as soon as their term is up. Furthermore, conscripts are notably ineffective and unwilling fighters as compared with volunteers, for obvious reasons. Once again, it is the moral approach which is practical. Many prophets of doom have cried that there can be no defense against modern missile warfare. In fact, the danger of such a war is one of the chief arguments advanced in favor of a strong government. It is said that only by maintaining a strong government can we hope to deter an enemy attack or successfully meet it when it comes. And, since hundreds of missiles are already aimed at various parts of the globe and don’t seem likely to be dismantled in the foreseeable future, we are told that we had better plan on keeping that government strong for a long time to come and not dream of experimenting with radical ways to improve our society, such as freedom. Since life doesn’t give any automatic guarantees of safety and success, it is true that even a strong free-market defense system might be overpowered by an all-out atomic-biological-chemical attack, should such an attack be launched. But so might a governmental "defense" system, so this statement doesn’t really say anything about the relative merits of free-market defense vs. governmental "defense." An examination of governmental "defense" shows that it depends on the use of initiated force against its own citizens and on much propaganda about government-fabricated foreign "dangers," and it requires citizens to sacrifice themselves for whatever government officials deem to be the good of the "public." The free market permits each man to defend his own values, uses no initiated force against and requires no sacrifice from customers, and penalizes those who refuse to live noncoercive lives. Governmental "defense" is unavoidably wasteful and a drain on the resources of the society. It is also ineffective in protecting the citizen against modern warfare and is likely to stay that way, because without competition and the profit motive it lacks sufficient incentive to innovate effectively. In the free market, competition forces businesses to cut costs and eliminate waste, and it also brings about continual improvements in effectiveness through technological innovation as businesses struggle to "keep ahead of the competition." But worse than its waste and ineffectiveness, governmental "defense" is actually little more than an excuse for imperialism. The more government "defends" its citizens, the more it provokes tensions and wars, as unnecessary armies wallow carelessly about in distant lands and government functionaries, from the highest to the lowest, throw their weight around in endless, provocating power grabs. The war machine established by government is dangerous to both foreigners and its own citizens, and this machine can operate indefinitely without any effective check other than the attack of a foreign nation. If such a war machine is unopposed by the armies of other nations, it is almost inevitably used to promote rampant imperialism. But if it is opposed by a war machine of equal strength and deadliness, then a balance of terror ensues, with the constant threat of a holocaust. Businesses in a free market can’t spare the cash for such perilous follies, because they gain customers by offering values to free men rather than by threatening force against disarmed subjects. Governments don’t really defend their citizen-subjects at all. Instead, they provoke wars, and then they force the citizens to sacrifice their money, their freedom, and often their lives to defend the government Such "defense" is worse than no defense at all! It is true that the missiles, the deadly chemicals, and the plagues of modern warfare constitute a very real threat. But these implements of mass destruction were ordered to be constructed by governments, and these same governments are continually bringing new and more deadly weapons into existence. To say that we must have a government to protect us as long as these products of government are around is like saying that a man should keep his cancerous tumor until sometime in the future when he gets better, because it would be too dangerous to remove it now! If collectivism has proved itself inefficient, wasteful, and dangerous in such areas as transportation and medicine, surely the worst place of all to have it is in the vital area of defense against foreign aggression. Wars and many other, less destructive kinds of human conflicts are the natural consequence of institutionalizing man-made violence in the form of governments! This is similar to the relationship which would prevail in a laissez-faire society between fire insurance and fire extinguishing companies. Insurance companies would sell fire insurance and would then either maintain their own facilities to put out fires or buy the services of independent fire extinguishing companies for their insureds (and anyone else who wanted to pay a fee for the services when used). Because the various insurance companies would find it convenient to have contractual agreements to buy each other’s fire extinguishing services when more feasible than using their own, it would not be necessary to have a fires station for each insurance company in every area. This originally appeared on Mises.org. 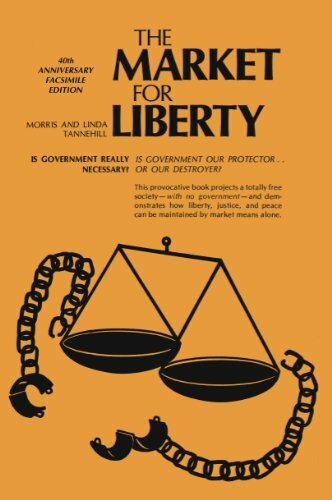 Morris and Linda Tannehill were two libertarian activists and thinkers who, in the early 1970s, made surprisingly profound advances in the theory of the stateless society. Their free-market manifesto, The Market for Liberty, was written just following a period of intense study of the writings of both Ayn Rand and Murray Rothbard; it has the pace, energy, and rigor you would expect from an evening’s discussion with either of these two giants.